Okay, I want to hurry up and get this kit out to everyone. I know several of you will be ready to start scrapping your Christmas memories as soon as possible. 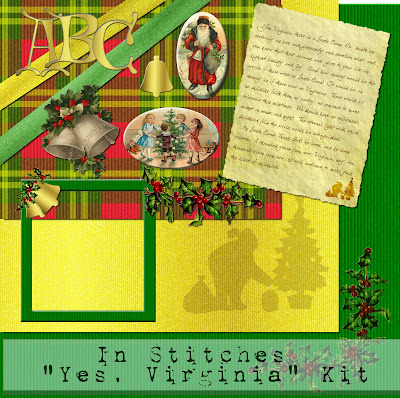 Today I made a quickpage for you along with the elements and alpha for the "Yes, Virginia" kit. I hope you all get some great pictures of your friends and family for your scrapbooking albums. Click on the links to download. Merry Christmas! Sister, we really have to start sleeping. Very cute pages. Thank you! Your blog post will be advertised on the DigiFree Digital Scrapbooking Freebie search engine today (look for timestamp: 25 Dec [LA 09:00pm] - 26 Dec [NY 12:00am, UK 05:00am, OZ 04:00pm] ). Thank you so much for this Freebie. 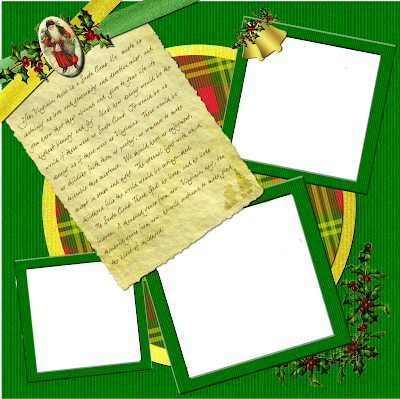 I want to let you know that I posted a link to your blog in Creative Busy Hands Scrapbook Freebies Search List, under the Christmas post on Jan. 01, 2009. Please, notice that I've changed my url. Thanks again and Happy New Year.